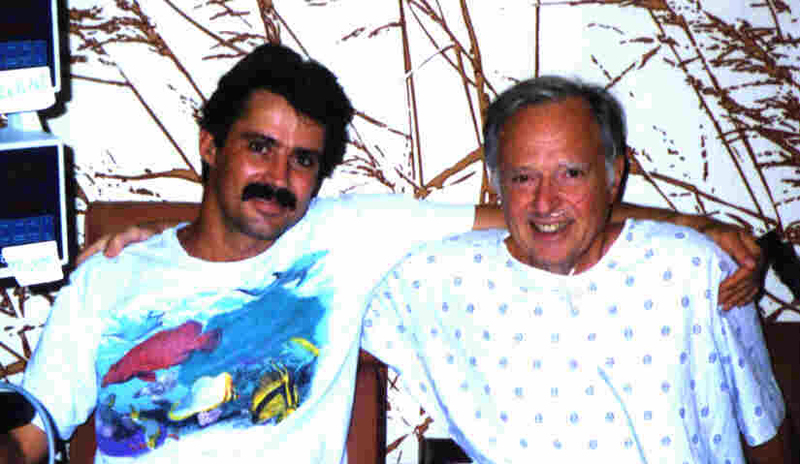 July 30, 1993: the day my second life began with a kidney from my Dad. In September 1992 I died, leaving behind a young wife and a 3 month old daughter. Or I would have. I was 35 years old, we lived in Hilo, and hurricane Iniki was bearing down on the Hawaiian Islands, destination uncertain. I have Alports Syndrome and my body had been attacking the collagen in my kidneys since I was born, slowly destroying them. As my kidneys began to fail I became weaker, sicker, and thinner — a slow slide to eventual death through the build up of fluids, toxins or both. It didn’t feel good. But I had the good fortune of being born into a time when it wasn’t a death sentence. Thirty years earlier I would have simply died. End of story. On that day in September, in a crazy wind and under a darkening sky, I cried as I drove to the hospital to begin dialysis: I was failing to take care of my wife and daughter and I was completely surrendering my life to the medical system. At the hospital they put in a shunt in my arm and I began the 3-a-week process of hemodialysis: 9-10 hours a week connected through two large needles in my arm to a machine that cleaned the toxins and fluids out of my body. At least that was the idea. Whatever you may think about the medical system I have nothing but admiration and respect for the nurses and doctors that took care of me. I was humbled by the patients at the Hilo dialysis clinic. Most of them lost their kidneys from diabetes or high blood pressure and were in various stages of health. Some just sat quietly moaning throughout the treatment while others, those with missing limbs or who could barely walk, sat staring silently into space: a harbinger of the future for everyone there. One patient, an 8 year old boy, came bounding in every night like he was going to a soccer game. I have never forgotten his cheerful disposition in light of his situation: they wouldn’t give him a transplant because his parents were incapable of administering the drugs he needed. Doomed to a life of dialysis I often wonder what became of him. Throughout it all the staff was pleasant, competent and positive and I endeavored to set a good example during my ordeal. No matter how bad things may look there is always someone suffering far worse. So, I kept working. In fact during the 11 months I was on dialysis I only missed one day of work — that day in the hospital when they hooked me up. I wanted the distraction, I wanted to focus on something, anything, than what I was dealing with. I was productive: how often do you have 10 hours a weeks of uninterrupted time to read textbooks, take notes, and plan lectures? But the dizziness, nausea, and sudden onset of leg or abdominal cramps was a constant reminder that dialysis is an imperfect solution to kidney failure. It keeps you alive, but barely. But I was not the one who suffered the most, it was my wife and my mother. My wife because she saw me come home at night weak, tired, sick and rail thin; my mother out of guilt. Alports is a heritable gene, typically passed from mother to son, and she felt responsible for my condition, even though she had been on dialysis for the last 7 years. Years later we dealt with that guilt. I told her what I firmly believe: I am a better person because of my experiences. What price can you put on newfound compassion and wisdom, at a second chance at life? Ultimately, a strong family is the key to surviving kidney failure. Without the slightest hesitation, both my brother Craig and my Dad stepped up to give me a kidney. It’s hard to describe how it felt to be offered a second chance at a normal life: it is truly a miracle, an amazing sacrifice and the ultimate gift. To makes a long story short, my Dad was identified as the best donor for me and my brother for my mother. In July 1993 I was reborn as a kidney was taken out of my Dad and placed into me. The effects were immediate: I began to pee again, my skin color changed, and I started to feel better. Now, after almost 22 years my Dad’s kidney is going strong and I feel great (and so does my Dad!). A month after my transplant my brother gifted one of his kidneys to my mother and gave her ten wonderful years of a second life. She passed away in 2003 due to complications from heart disease and a stroke — undoubtably from her many stressful years on dialysis. Now I’m living my second life and I’m determined to make it count. My beautiful wife and I have been together for 28 years. My daughter is graduating from college next month and my son (born 2 years after my transplant) just started college. I am currently a Professor of Marine Biology and Director of the Marine Laboratory at Humboldt State University. I am very much alive.